Description: Afraid of competition? Lease their engines then wreck em. Description: Rear helper on eastbound coal empty. 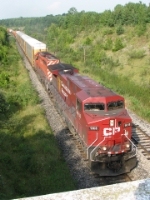 Description: Canadian Pacific in Oklahoma! 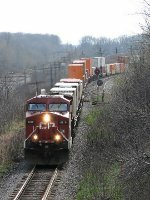 Title: CP 9818 at Coakley. 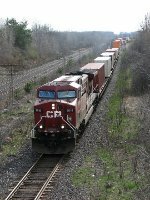 Description: A westbound manifest rolling around curve outside London, with CN' Strathroys Sub on the right. Title: CP 9818, CP's Tomah Sub. Description: 38T passes an old water tower foundation on a Winter afternoon. Description: CP 241 heads West towards Porter Junction in Chesterton, IN.